At Wyndham Rose Hall Resort and Country Club, the newly renovated 18hole, par71 championship golf course, Cinnamon Hill, offers a great variety of mountain, island and ocean views. Spanning 400 lush acres between the verdant Jamaican Mountains and stunning Caribbean Sea, Rose Hall Resort & Spa proudly features Cinnamon Hill Golf Course. Cinnamon Hill is situated on what used to be a 400acre sugar plantation, and remnants of the area's history  such as aqueducts, inlaid stone walls and sugar mill plantation ruins are sprinkled throughout the mountains and valleys. Stretching from Jamaica's lush Blue Mountains out to the coast and striking blue waters of the Caribbean below, Cinnamon Hill offers nearly 7,000 yards of greens and tees suited to players of all skill levels. Designed by Robert von Hagge and Rick Baril, Cinnamon Hill was created with the resort player in mind. It is a seductive layout with an open, windswept front nine giving way to a tight, trappy back nine bordered by dense foliage. Designed and opened in April 2001. 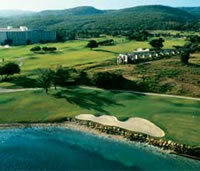 It immediately pass the test by the Caribbean Classic golf Championship. The course plays from sea level to 900 feet and is blessed with refreshing daily trade wind. A 18th century sugar mill ruins, aqueducts and stone wall run throughout the course.